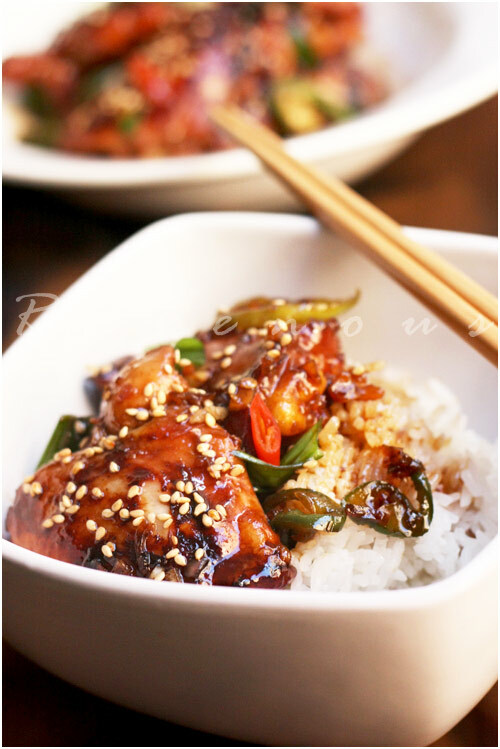 Caramelized chicken – ga kho is such a simple yet delicious recipe that you’ll want to keep as your quick go to dish for an easy but delicious dinner. Mom used to make this dish with a lot of ginger and caramelize the chicken in much the same way as our ca kho to (fish in clay pot), but there’s more then one way to skin….er, caramelize a chicken so to speak. Chef John from Food Wishes has a super easy method of combining fish sauce, sugar, water, and vinegar into a one step caramelization process without making your own caramel sauce or using store bought caramel. His recipe results in a familiar caramelized sauce that is sweet, savory, and gooey delicious. It’s so simple and we’ve made several times, never getting tired of it. Marinade the chicken with 2 tbs of fish sauce and 1 tbs brown sugar for about 1/2 hr. In the meantime in a small bowl make the sauce by combining 3/4 cup brown sugar, 1/3 cup water, rice vinegar, and fish sauce and mix until dissolve. Add the ginger, shallots, and garlic and set aside. Heat a large pan on high with cooking oil and add the chicken with the flat surface of thigh facing down. Allow to sear without touching them for a minute or so and then pour in about 1/4 of the sauce. Try not to move around the chicken as you want the chicken to sear and caramelize. The sauce will start to thicken and the chicken will brown after a few minutes. Check to see if it’s nicely caramelized, then turn the pieces of chicken over and pour in the rest of the sauce. Continue to cook until sauce is reduced to nice thick consistency and just as you turn off the heat, toss in the chiles and green onions. Transfer to serving platter and generously top with roasted sesame and fresh cracked pepper. Enjoy with plenty of steaming hot rice and we’re confidant that this will become a part of your normal dinner routine. This recipe is so easy you can vary it by substituting lemon grass in the sauce or finish off with basil in addition to the jalapenos. Ca Ri Ga Vietnamese Chicken Curry ..in a Pot Pie! That looks so amazing! I prefer chicken on the bone too, it really does help with the moisture. So great to be reading all these Vietnamese recipes, I feel like I've been missing out on some great food in my life! Looks really tasty! I saw this in one of my cookbooks, now, I really want to try! I'm hoping to make this tonight…. Just want to let you know that I made it tonight for our supper. It was SUPERB! Whole family loved it! Thanks for sharing the recipe. connie: well, it's never to late to try..this up in SF, this is one of slanted door's more popular dishes! mycookinghut: ga kho is one of those dishes that is so homely and comforting. i'm a black meat person, gotta be thighs instead of breasts!!!! 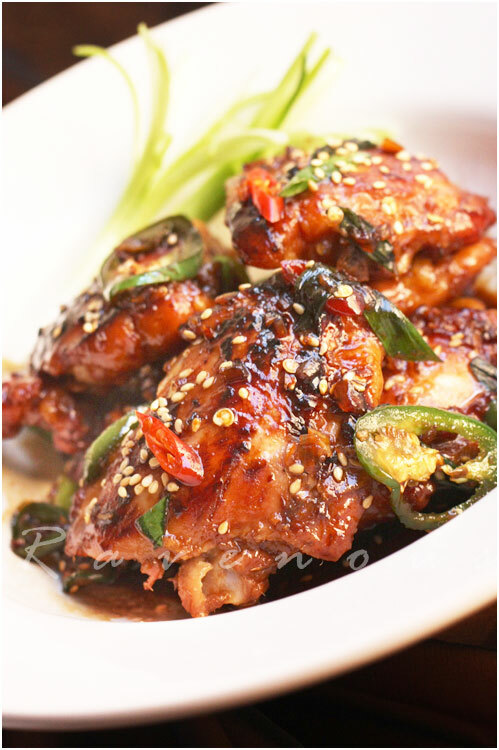 lululu: caramelized chicken works best with dark leg/thigh meats. Let us know if you try this! I will try this the next time I cook chicken. Looks really flavourful and delicious! Delicious, my kind of food. Will definitely be trying this one soon, thanks. That sounds like the perfect comfort food after a long day ! Little Teochow: Thanks and it's really quick to prepare. MrsLavundula: Ga Kho is one of our favs! Debs: Let us know how this caramelized chicken goes for you. Chocolate shavings: Ga Kho is also not that long to prepare after a long day either. If you're rushed for time, you can skip the marinations step. This dish looks & sounds simply wonderful! Thanks for sharing! Wow, thanks for the link! You guys take some amazing photos! I'm very envious. Sounds so sweet and flavorful. May be worth a try. Chef John: Thanks for the great recipe! Something as good as ga kho needs to be made often. 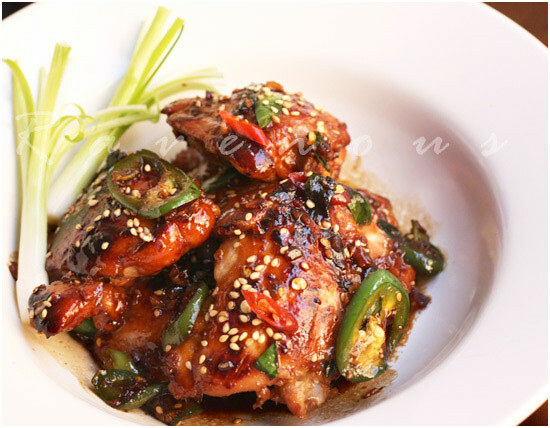 Duo Dishes: Caramelized chicken is really sweet and savory. Thanks for the comments! rita: you're always so funny and fashionable!! I've got shop bought caramel, which I'm assuming will be okay? Looks so delicious – keep up the good work! Nii: With this recipe you don't need the extra caramel sauce! We'll guarantee that the sauce above will caramelize. That's the beauty of it…one less ingredient! Thanks for stopping by and the compliments! nutrition to Kitchen: Thanks! We love caramelized chicken too. What a wonderful chicken recipe and great photo. I am so glad you shared it with us. sweet and savory: thank you! hope you try this caramelized chicken and let us know what you think! Mmmm, I have GOT to try this. Looks fantastic! gaga: do take photos and let us know how it goes! Made this last night after seeing it on tastespotting a couple of weeks ago. DELICIOUS! It's definitely going to be a regular in our house. Thanks for sharing this recipe. didn't read carefully and left the skin on and forgot the cracked pepper, but it was still awesome! Will add basil next time – can't wait to try it. Tia: So glad you enjoyed it! Definitely experiment with basil and lemongrass! I made this tonight, and it was great! Rave reviews all the way around. Can't wait to try it with lemongrass now. Thank you so much for suggesting this recipe. Made it tonight and it was FABULOUS!!! And easy to boot. You're my heros. Kt and Amy : So glad you enjoyed the ga kho! 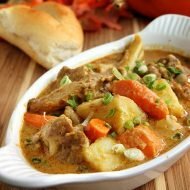 I have always hated ga kho gung but made a leap of faith and tried this recipe. It simply rocks! Thank you for showing me what I was missing in life.. This is the first recipe I have tried from your website,and OH MY! !…better than grandmas ga kho! I can not wait to try ALL your recipes. Loved it!It was so fragrant and flavorful. Thanks! I tried this recipe the other night and it was so yummy. I'm now wondering if I can replace the chicken with pork ribs? Please advise. Thank you for the great recipe. @anonymous: give it a try! it should work..however, we love our sweet and sour spare ribs recipe so much we don't try to experiment with others! Can this be done in a crock pot? If so please direct…thanks! yes, it should probably work! Ca kho to is one of my favorite dishes! And this chicken version looks delicious. Could you tell me how many people this recipe serves? Thanks! I tried your recipe today, it was so good. My bf is very picky but he loved it and will eat it tomorrow for lunch. I had sauce left over but didn’t want to throw it away. Saved the sauce for another day when i’m going to eat it with just plain rice. The sauce is finger licking good! I just want to say I love your site. I found your site while searching for a grilled pork recipe and just tried the caramelized chicken and it tasted delicious! Your recipe is so easy to follow even for someone who can’t really cook like me! Thank you! Looking forward to more recipes! This was just delicious! I made this with ginger and the balance of flavours was perfect. I’m catering for 60 people on the weekend and thought this could be good to serve, so I experimented, and rather than having this with rice we had this on a baguette with nuoc cham dressed salad (shredded Chinese cabbage, mint & basil) and a little Japanese mayonnaise – yum, and it will be perfect for a big lunch on Sunday! Thanks for the fantastic recipe, I’ll look foward to making it again just for us soon. I just made this recipe last night to great success. Ive tried at least 6 different recipes for caramelized chicken but could never achieve that stickiness and the level of pungency that I craved. Yours was the platonic ideal of caramelized chicken Ive been looking for. Better than mom I have to say. Thank you, this was the recipe Ive been searching for, for years! Fantastic! Turned out sweet, tangy, savory and deliciously-caramelized. Could you do a recipe of Ga Kho but with fish. My Vietnamese mom makes the best and I’m still trying to figure out how to do it myself. Can’t stop eating it when she cooks it. You should make sure that you use Vietnamese fish sauce, not Thai. Viet fish sauce is less salty and adds the correct flavor. Have mad this many times and prefer it with lemongrass and basil. Just amazing! Thank you for the ga kho recipe. I made it earlier. It was delicious! It looks amazing! Can’t wait to try this! 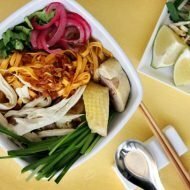 Could someone clarify ‘green onions’ is that spring onions (in the uk) or a regular what I would probably call white onion? Thanks! This looks great. I may opt out on the fish sauce but I do wonder how it would taste with chicken so I’m up in the air with that decision. Thanks for sharing. Will be making this soon. Wow. I pinned this today, and knew I had to make it tonight for dinner. I didn’t serve it with rice, but I should have…that would have balanced the ultra sweet caramelized sauce perfectly! Even without, we thoroughly enjoyed with some sautéed sugar snap peas. I confess to adding some chopped peanut and cilantro before serving…maybe a little more Thai than Vietnamese, but delicious never the less. Thank you, for a WONDERFUL recipe, and my first successful attempt at Vietnamese cooking. it was really good but it was too much salt…who ever who wants to try this recipe should cut the salt in half. I made this for my boyfriend last night. He said it was so good, he wanted to slap me! (Haha.. not literally though. It’s something he says when I cook a good meal. Apparently, it’s a southern thing.) But this is definitely going to be on my keeper list. 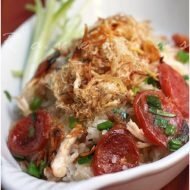 i’m Vietnamese and my original recipe is a little different and less caramelized but I like your version even better! Thank you for being food lovers and sharing!! Tonight was the second time I cooked your version of this dish. Utterly delicious! The first one I used lemon grass and tonight I used ginger. I cut up whole chicken and the variety of meat made the dish even more interesting (I think) – my daughter loves the white meat (not dried at all) and me & hubby were fighting over the wings and drummette parts.. Your version is the easiest, simplest, yet produced the most perfect outcome: caramelized, umami and enough heat to make us eat the 2nd or 3rd bowl! Thank you for sharing the recipe! Do you think I can make this dish in a crockpot? I love the flavour, but would like to make it into pulled chicken to have with banh mi. Do you think it would be too salty if I cook the chicken and sauce in a crockpot for hours? Brown sugar is the less flavor route, real flavor develops from caramelizing plain cane sugar, we use Florida Crystals. Came home late from work, saw the chicken was prepared for my wife’s gà khô, found out she was gonna come home late, so not to let the chicken go to waste I searched and find this great recipe. The result was kind of different from my wife’s version, but I liked it, and so did the kids! Made this tonight and omg Love this! !! Making it as we speak and the smell and look of it is delectable. Should the heat be lowered after seating or should it remain at high?